When Nicholl Food Packaging acquired its major competitor in 2001, it became one of the two largest European suppliers in its sector. Not bad for a company that had only been in business for twelve years. Now part of Advanata, Nicholl supplies aluminium containers for the catering and fast food/ethnic take-away trades, for institutional caterers and for the bakery industry, next time you buy a Mr Kipling cake, it will be packaged in a Nicholl foil cup. The company operates from three manufacturing plants in the UK, the head office being in the West Midlands. Its vertical presses turn out 800 million medium to large containers every year. 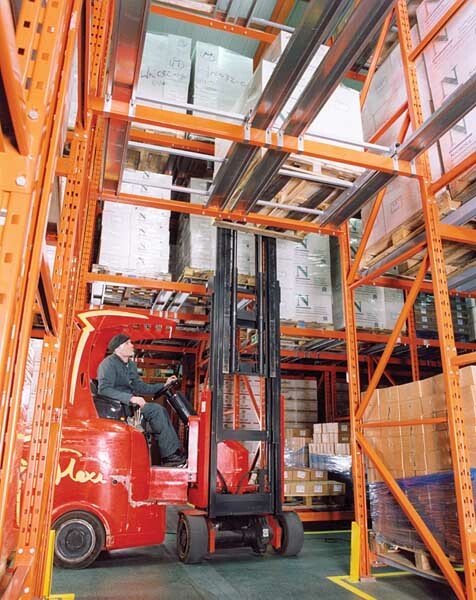 A major refurbishment of the site’s storage and distribution facilities took place in 2001. As the warehouse floor needed to be replaced, the existing racking had to be removed. Effectively starting with an empty building meant that Nicholl could re-plan the warehouse layout in order to make better use of the available space. Peter Reay, Nicholl’s Operations Director, contacted Redirack to help with the design. “Redirack have been our preferred racking supplier since we started. As a company, we like to develop strong partnerships with customers and suppliers alike. We work well with Redirack, they understand our requirements and are easy to do business with.” Says Peter. The new layout in the finished goods warehouse, consists of six runs of push back racking arranged to store the pallets two deep. Each run is fifteen bays long and each bay has a clear entry accommodating two pallets. Predominantly, the scheme has three storage levels, although a small area has four beams. Cross tunnels at either end of the racking allow transfer access for the fork lift truck. 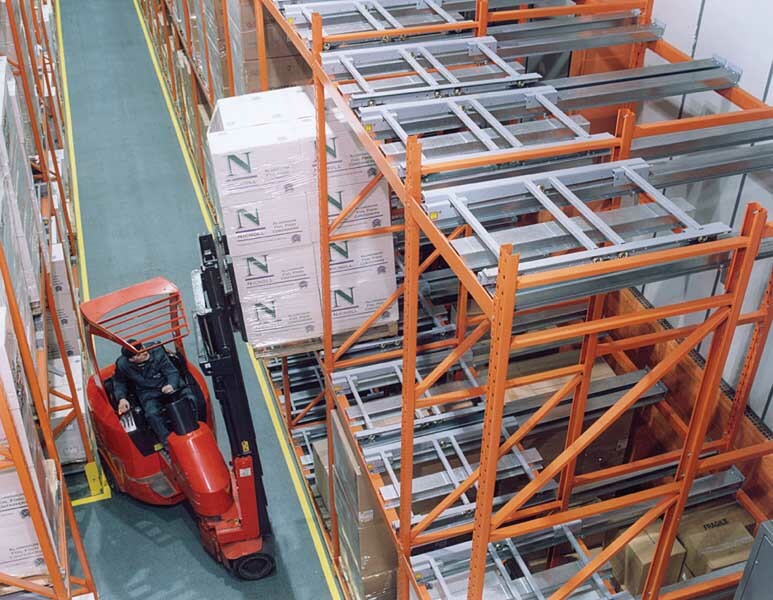 The operating aisles between the runs of racking are only 2.1 metres wide. Pallet handling is, therefore, performed by Narrow Aisle Flexi trucks. Push back provides a high density storage system suited to many applications and conditions. It consists of telescoping trolleys on rails mounted at a small gradient. The rails are bolted to standard rack beams. Trolleys have horizontal tops in welded and bolted construction with ratings from 500kg to 1500kg maximum load. The galvanized rail design ensures that the trolleys run freely. Push back systems are operated using standard types of fork lift truck. When a load is removed from the picking face, the rear pallet gently rolls forward to replace it. 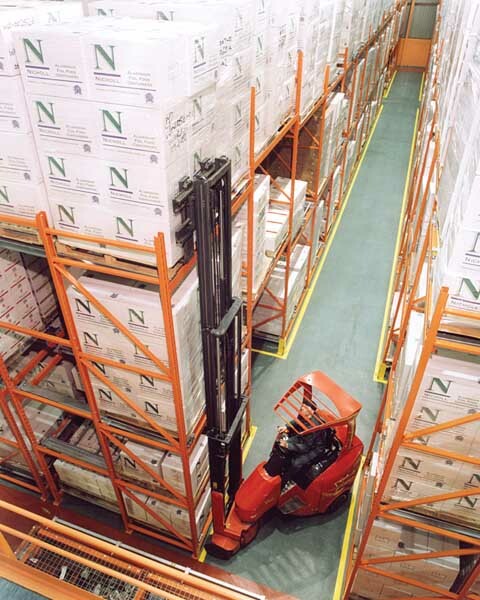 The combination of push back racking and the narrow aisles has enabled Nicholl to increase the number of storage locations in the warehouse by an impressive 33%, in comparison to the previous layout. This means that the company has been able to reduce the amount of third party storage it employed.